Intimations of an understanding that Earth had a significant history are found in the writings of Herodotus during the 5th century B.C. While traveling on the Nile Delta, he realized that the sediments had accumulated from river floods and that thousands of years had been required to form the visible part of the delta deposits. However, the contrast between human history and geologic history did not really become fully articulated for more than two millennia. A bit over two centuries ago, James Hutton recognized the significance to Earth history of the angular contact between two sets of sedimentary rock layers at Siccar Point on the southeast coast of Scotland which set in motion the modern science of Geology; horizontal beds of sandstone that formed the land surface beneath Hadrian’s Wall, already old in terms of Scottish history, rested on the vertically upturned edges of still older sedimentary rocks. 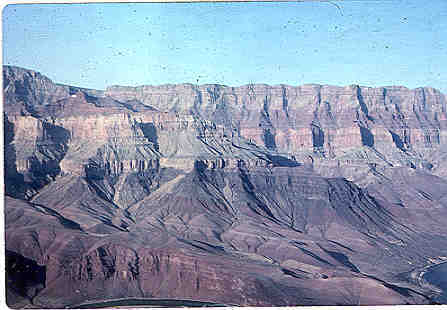 Those older rocks had to have been lithified from unconsolidated horizontal sediments before being deformed to their present attitude and eroded to form an ancient land surface beneath the sandstones. Here was indisputable evidence that Earth had a history that far pre-dated human history. Thus the time context for humanity was clearly established and has been reinforced by all subsequent geologic work. We are a part of the fabric of Earth’s biosphere and we are not likely to disappear in the forseeable future, but there is growing concern about our effect on the global ecosystem and the quality of life that can be sustained for our descendants. By recognizing the vastness of Earth history compared to human history, we internalize what John McPhee has termed Deep Time and we gain an essential perspective from which to consider the results and consequences of our human impacts on Earth. Preserved human artifacts and written records show clearly that we modern humans have essentially experienced only the present landscape. Even if it has been locally modified by geologic processes, the painted caves of the Pyrenees remain as caves and some ancient city ruins of Mesopotamia and tombs of pre-dynastic Egypt remain standing on flood plains. The clear archaeological evidences for recency of the advent of modern Homo sapiens, dramatize the awesome changes have been wrought on our planet by humans in the recent historical past. It is only necessary to look out of an airplane window while flying over central United States to see how much of the land surface has been altered by human activity in less than two centuries. Satellite images document how much urban sprawl in the U.S. has changed the landscape and natural ecosystems within even shorter spans of a few decades. Geologists have no problem with the concept of Deep Time, but it is clearly a concept that is not widespread at a very high level of consciousness in the general public. Raising the level of public awareness of this concept is our challenge and our responsibility. As one contribution to this challenge, the concept of Deep Time and the context of humanity has been captured visually in GSA’s affordable 20-minute teaching video “The Earth HAS a History," that can be purchased from the Geological Society of America (1-888-443-4472). Several other ways to try to get the key idea of Deep Time into the public domain are suggested in the following demonstrations. DEMONSTRATION 1 - Demonstrating that EARTH HAS A HISTORY is relatively easy. GSA’s teaching video with that title utilizes the concepts of original horizontality and superposition, and the processes of deposition, deformation and erosion on a virtual field trip to sites all within view of one another around Boulder, Colorado, to make the point that the only landscape known to even the earliest Native American inhabitants of the region contains a rich story requiring vast amounts of time. This approach can be used in many areas by creative teachers to make the point of the antiquity of Earth compared to human history. Almost any rocks in your area can serve this purpose. A good way to begin is to look for common, ordinary processes that affect the rock. If there is a gravel pit, the sizes of the cobbles in the gravel provide an opportunity to discuss the rate of accumulation of gravel that contains cobbles of that size, the kind of current needed to transport those cobbles, the likelihood of such discharge, and the time it would take to accumulate a gravel bed of given thickness. If a rock outcrop is covered by lichen, some simple library research could determine the identity of the lichen, how fast it grows in the region, and what the size of the colony implies about the age of that particular rock exposure. DEMONSTRATION 2 - The principle by which we arrive at numerical ages can be explained in non-technical terms, but the technical details are difficult to comprehend and perhaps not necessary. In a non-technical approach, we can explain that in rocks that cooled from a molten state (like granite, which cooled slowly some distance underground and thus has large mineral grains, or basalt, which cooled relatively rapidly from a lava flow and thus has much smaller mineral grains), some of the crystallized minerals contain radioactive atoms of an element that decays at a known rate to produce a recognizable decay product (daughter) which is another element. Once that mineral has crystallized, it becomes a closed box, and the radioactive atoms and their daughters will both remain within the box. Although some leakage is possible, there are ways to detect such leakages and make corrections for them. Very sophisticated chemical analyses can detect the amount of the radioactive element and its decay product in the mineral grain (box). The longer the mineral has been a closed box, the more daughter element there is relative to the parent. Because we know the rate of decay of the parent, we can tell from the proportions of the daughter element vs. parent how old the mineral is. Of course, this doesn’t work on sedimentary rocks such as sandstones because the mineral grains were eroded from older rocks and thus any age we get is not the age of the sediment, but the age of the rock from which the mineral grain was eroded. Even so, if we can identify minerals that have formed subsequent to the deposition of the rock, we still have a way to measure the minimum age of the rock itself. If the rock is organically precipitated and is relatively young, like a coral reef, the decay of radioactive uranium, incorporated from sea water into the skeleton by the coral polyps, into its daughter product, lead, allows the age of the reef to be determined. If students have grasped the idea of metamorphic rocks, then it can be explained that numbers from minerals in those rocks most commonly date the time when those mineral grains were recrystallized during metamorphism and became closed boxes. This time will be much younger than the age of the original rock before it was metamorphosed. DEMONSTRATION 3 - Many people do not understand that carbon-14 dating can only be used on very young Earth materials. Again, a non-technical explanation may suffice to make the point. Every living organism, plant or animal, is constantly processing carbon dioxide through its system. Some of the carbon in the carbon dioxide is the product of interactions between cosmic rays and nitrogen high in the atmosphere that produce an unstable form of carbon we call carbon-14. This unstable form will gradually decay back to nitrogen, but more is being created all the time at about the same rate as the earlier carbon-14 atoms decay. The unstable form is thoroughly mixed with the more common and stable form of carbon – carbon-12 – so that the ratio of carbon-12 to carbon-14 is essentially constant in the carbon dioxide of the atmosphere and the carbon dioxide dissolved in an ocean or in bodies of fresh water. An animal or plant builds carbon into its structure (bones, shells, leaves, wood) as it grows, and that carbon has the natural environmental ratio of carbon-12 to carbon-14 because the growing organism doesn’t significantly distinguish between the two forms. When an organism dies, it stops adding carbon. Over time, the part of the carbon in the organism that was carbon-14 decays until all that remains is carbon-12. Thus, the longer the organism has been dead, the smaller the proportion of carbon-14 that can be detected, again by tricky chemical analysis, in the remains. With increasingly sophisticated technology, we can now determine when an organism died by using carbon-bearing remains (usually bone, shell or wood) that are as old as 70,000 years. For materials that have been dead longer than that, there is too little remaining carbon-14 to detect. While 70,000 years sounds like a long time to most of us, it is only a fraction of the millions to billions of years that can be estimated from analysis of minerals found in most granites or similar rocks. Thus, dating of materials using the carbon-14 technique is primarily of value in archaeological studies – that is, dates of happenings well within the geological history of human beings. Further reading: Taylor, R. E., 2000, Fifty years of radiocarbon dating; American Scientist, v. 88, no. 1, p. 60-67. DEMONSTRATION 4 - To really put the impact of humans into the deep time perspective, an effective basis for an analogy is a football field (actually a soccer field is better because it has metric dimensions and so the math is easier). If the age of the Earth (4.5 billion years) is scaled to the length of a soccer field, depicted at the top of a sheet of paper or overhead transparency, then one millimeter equals 45,000 years. Enlarge that one millimeter as a horizontal axis marked off in tenths (4,500 years) on the lower part of the page and show the locations of the beginning of the last de-glaciation (13,000 years), the beginning of the agricultural revolution (10,000 years), and other historical events such as the pyramids (5,000 years) – this is usually enough to get the scale across. Then make the point that most of what we commonly study as human history has all happened since the beginning of the agricultural revolution – about ¼ of our original millimeter of the soccer field, or roughly the thickness of a blade of grass on the goal-line! For continuing discussion (below) also show the proportion of that time line that represent the last 500 years. A downloadable image of this figure is provided on the webpage Visualizing Deep Time. How many other ways can you or your students devise to communicate the concept of deep time? When discussing deep time with adult audiences, you might bring in this beautiful quote: “In the presence of eternity, the mountains are as transient as the clouds” attributed to Ralph Ingersoll, well known public speaker of the 1930’s. The essence of this quote is found in the Qur’an, (Sura 27, Aya 88) written 14 centuries ago – a remarkably prescient geological observation! If you use the quote, it might also be appropriate to distinguish between deep time (something finite, measurable and testable) and eternity (a philosophical concept). To further emphasize the impact of humans on earth, construct a vertical axis at the present-day end of the one-millimeter time-line, scale off seven tick marks at one-inch intervals representing global human population in billions, and draw a population growth curve for the past 500 years, noting that population prior to that time was probably less than 1 billion, but it was about 1.2 billion in 1910, 2.5 billion in 1950, 5 billion in 1990, and today is 6 billion. On the scale of the time-line, this is essentially a vertical line. Cover this part of the diagram on the overhead transparency until the point about the time scale has been made. Then reveal the population curve, note its resemblance to a rocket, and point out that this curve shows not only population growth, but also growth in consumption and in production of wastes. This usually gets the audience’s attention! The audience is now prepared for discussion of SPACESHIP EARTH, ECOLOGICAL FOOTPRINTS, RESOURCE ISSUES, and other facets of sustainability. Part X: What Do We Mean by Sustainable World? INVITATION BASIN is a community project actively seeking public participation. We appreciate all feedback and welcome comments, suggestions and contributions. To find out more about how you can be involved, click here.